The famous Piccadilly Lights were switched back on this week after nine months of renovation work to create a new ultra-HD digital screen. Landsec, the owner of Piccadilly Lights, has replaced the original patchwork of screens with a single state-of-the-art 4K LED digital screen, which measures 17.56m high x 44.62m wide (circ 780m²) and features three in one LED packages that generate trillions of colours and exceptional brightness. It is powered by a live technology hub that enables the screen to react to certain external factors, such as the weather or temperature. This feature also enables brands to display creative and innovative content, such as weather-appropriate clothing. The billboard will also be able to determine the “gender, age group and even emotions” of nearby pedestrians, too, and “deliver bespoke ad content” to them, according to Landsec. The company tells The Verge, however, that it won’t collect or store any personal details of passersby. The countdown and launch moment was streamed live across Facebook and YouTube, and the first image to appear on the new screen was a spectacular display of colours, which was sponsored by members of the public as part of a fundraising campaign for Barnardo’s. 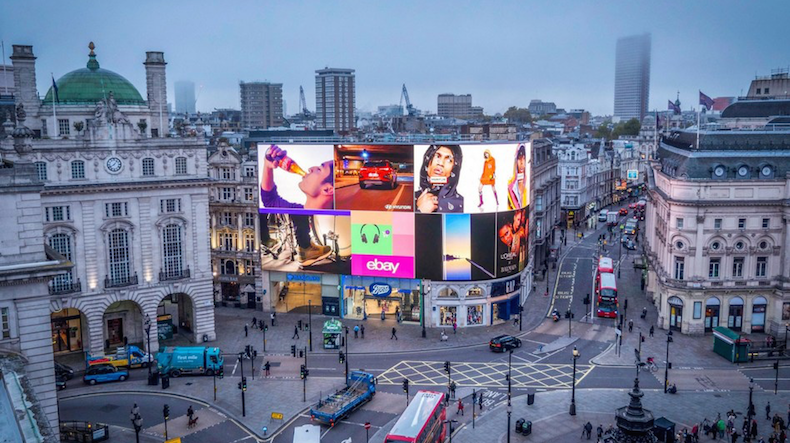 “The Piccadilly Lights has been one of London’s most iconic sights for over a century and is an unmissable attraction for the 100 million people who pass through Piccadilly Circus every year," commented Landsec portfolio director Vasiliki Arvaniti. "We know people have really missed the screen while renovation work has been carried out and both we, and the brands that light up the screen, are incredibly excited to have switched the lights back on today."